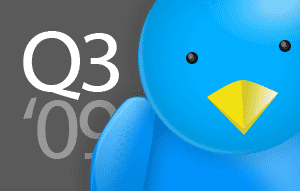 With Telerik's Q3 2009 Release Week set to kick-off tomorrow, it's time to introduce this release's Twitter Contest! Just as we did during Q2 this year, the official release Twitter contest is your chance to have some fun mentioning your favorite Telerik products while earning chances at winning Telerik prizes. This is a great chance for those of you that can't attend the upcoming Release Week Webinars to have a shot at some of this week's prizes. That's it! Two winners will be announced on Friday, November 13th. Each winner will receive a Telerik Premium Collection ($1300 value) or, for existing customers, an extension to their current license. Of course, only one entry per Twitter account will be counted, so no spam. This list features many of the Telerik tweeters that primarily publish Telerik updates. It's a convenient one-stop list for all of your important Telerik Twitter updates. Enjoy the list. Enjoy the tweets. And very soon, get ready to enjoy Q3 2009! Shoot! I missed this contest. @Lawk - Don't worry, you haven't missed anything! You have until midnight (EST) on Nov 12 to "tweet to win." @Jordi - There was no Wednesday webinar. :) The final webinar was on Tuesday, but we'll be announcing the Twitter winner today! Its already the 15th where are the winners posted?